Spoiler alert: If you’ve not yet seen Les Miserables and intend to do so, you might want to wait to read this after you’ve done so. AND If you’re not planning to see it? Change your plans. It’s worth it. I suppose it’s safe to say I’m a die-hard fan of Les Miserables. I’ve seen the Broadway version at least 4 times. I’ve memorized every word. I bought a hat like Eponine’s after I saw it the first time and it has been a part of my style for more than 20 years. Last night I saw the movie with Chase & Ashley, both 18. They had never seen it. I’d give it a solid B; however I gave every single live performance a standing ovation. Below is my review including what did and didn’t work. The endless close-ups while people sang solos compromised the flow of the overall drama. Any feeling human being will cry during Les Miz. I felt like the director was pushing the issue with all the close up angst as if to command the audience to cry. We needed no prompting. Instead of drawing nearer the characters in pain (as we do in the play), the close-ups made me draw back. I don’t think they ever completely sang Do You Hear The People Sing and if they did, there was so much commotion on the screen that it was hard to focus on the words. I’m pretty sure they did NOT include the words of the reprise version which are vastly different than the first time it is sung. The first time it is a battle cry; the reprise version is a song of redemption. In the play, those who have died appear one by one standing near Jean Valjean, clothed in white, with golden light falling on them. They are marching and their song is a slow crescendo in which you can hear every single word: and the WORDS are critical to the entire story. It is a song of Hope and Gospel. In the movie, these folks are “resurrected” at the barricade at which they died, and in the background you see a ruined France in black and white. It is as if the filmakers decided the photography of film is more important than the song. Really bad call I think. The close-ups sacrifice scenes which demand long sweeping visuals. For example, in the song Stars…you see no stars! You are focused on Javere’s face. In empty chairs & empty tables? You don’t notice the chairs & tables. The entire opening scene through the point where Valjean declares, Another Story Must Begin!! That portion was ovation-worthy. The fight between Valjean & Javere…was better in the film. The actors acted rose to the challenge! Even Russell Crowe’s average voice worked because it was representative of his character and he delivered like a pro. Maybe it is because of the time in which we are living but Gavroche’s death was more powerful in the film. The building of the barricade in the film was pure entertainment. Valjean going to assume custody of Cosette was better in the movie. In the play that scene is mighty slow; in the film they’ve added a scene immediately afterward that nearly brought my son to tears. OVERALL…Les Miserable is a story I don’t think anyone should leave the planet without knowing. The film has made it accessible to millions of people who will never see the play. It is a movie more likely to be seen by several generations together. Today, I texted Chase and asked him: Do you still hear the people sing? And he replied, “I do!” And then went on to have a textversation with me about the film. It is and was worth it: to be able to introduce the next generation to a story of such power and truth and hope makes it easy to look beyond the things I did not like in the film version. That said, if you DO only see the film, I’d recommend you get the broadway version of the music and listen to it, perhaps with the lyrics in hand. That way, you’ll be sure to hear the full version of the song that stays with you long after the credits roll. Lost in the valley of the night. 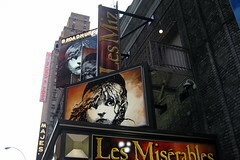 Les Mis is one of my favorite Broadway Plays. I read the playbill word for word before seeing it so I would know what it was about. I will watch the film, but wait until it is on cable.